1. Choose a type of seating configuration 2. Try to fit the type into the optimal range of viewing distance diagram 3. If it did not generate the proper number of seat, try one or both of the two options below to get more seats. Option B - Creating another tier above following the geometry of the original one. If it should be asymmetrical, try to consider the direction of the sunlight and get rid of some seats facing the sunlight. Option A - Extend the seating configuration to a certain degree within the range of maximum viewing distance. But it will sacrificing the viewing quality of some seats. Structural Analysis of The Surface This project is about how to design a stadium based on using parametric modulation with mathematically generated form. We started with a “seed” which generates forms with lots of practical restrictions, “real variables”, following basic principles of the stadium design. By manipulating all the variables, we explored all kinds of possible forms generated by the seed and went through several selection processes. In the nearest future, the decentralizationpolicy will continue, recognizing the need to relieve the overcrowded Central area. The trend will manifest itself as a spreading of commercial activities to the immediate surroundings, such as the Marina Bay, which is already under developmment, as well as the development of new commercial centres or nodes. One of the most important features of Han-ok is that each building element is separately fabricated offsite and then assembled onsite. This well suits to the object-oriented feature of BIM modeling which requires individual building elements to be separately modeled. Object-oriented modeling, however, is somewhat problematic in terms of efficiency. Tens of thousands of building elements are needed to build a simple house and there are various kinds of combination of building element. It takes a vast amount of effort to make BIM models in that architects usually need to make several design alternatives. Therefore, we need a reasonable modeling methodology that is based on the structural principle of Han-ok and topological approach. I applied the structural principle of â&#x20AC;&#x153;Kanâ&#x20AC;? to the assembly unit for modeling, which makes the modeling much simpler. For example, over 17,000 building elements are needed to make a model of a house, while just 24 assembly units are used to make the same model. An assembly unit is a bundle of building elements that are closely related to each other. In case of a frame type assembly unit, for example, the building elements of 4 columns, 4 small columns, 4 foundation stones, 5 purlins, 5 purlin supports, 4 beams, 8 beam supports, 2 king posts and comprise an assembly unit. Furthermore, an assembly unit can be combined with other assembly units to complete the entire structure of a house. Assembly units are divided into five types: roof, rafter, frame, floor and wall. A model for a house is completed by the proper combination of these five types of assembly unit. frame-type assembly units consist of such elements as columns, purlins, beams, and foundation stones. Wall-type assembly units consist of such elements as windows, window frames, wainscots and lintels. Floor-type assembly units consist of On-dol and Ma-ru, which are traditional Korean floor systems. Difference Between Types Roof design varies according to the vertical relation of the structural frames, even same combination of structural frame are used. In case of Iro-dang, the column purlins on X-axis(5-purlins) and Yaxis(3-purlins) make two joints at the inside and outside of corner. Also, the middle purlins on X-axis and the top purlin on Y-axis make two joints on the upper level of former. On this vertical relation, corner rafter can take place above the two joints of purlins which are located at the outside of the corner. It enables the edge of the eaves to have continuous form and makes a roof shape-II which have both hip and gable. On the other hand, Chunghyo-dang has different vertical relation of the structural frames. First of all, the column purlins on X-axis(5-purlins) and Y-axis(3-purlins) doesnâ&#x20AC;&#x2122;t have the same height and doesnâ&#x20AC;&#x2122;t make any joint at the corner, either. Instead of middle purlins, column purlins on X-axis make joints with top purlins on Y-axis. Because the column purlins are not connected at the corner, corner rafter cannot take place. Consequently, it has roof shape-III which does not have hip line but gable. The comparison between Iro-dang and Chunghyo-dang shows that the roof shape varies according to the vertical relation of the structural frames. Application of Assembly Units Architects can use assembly units at the early stage of their design process based on the feature of assembly unit optimized for customization. After a overall frame design is finished, architects can control some detailed part, such as changing a dimension of a building element and determining a type of joint connection. Each dimension of the building elements in the assembly units are defined as parameters in parametric modeling. If an architect changes a value of a parameter, the value of the other parameter that is relevant to the first one is automatically recalculated. 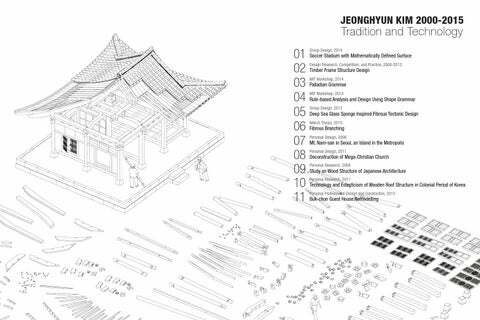 There are various types of each building elements in traditional Korean architecture. They are traditionally classified according to their shape and construction method. For more efficient modeling, I re-categorized them with regard to parametric operation. The categorization method is based on the modeling command, such as sketch, cut, extrude, and loft. Parameters are defined according to each modeling command and the form of building elements are described by the parameters. 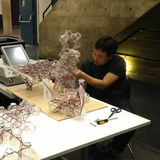 Topological Modeling I re-categorized the building elements of Han-ok to increase the efficiency of modeling. Unless there are topological distinction between two building elements, I classified them into a category. There are tree types of formula which define the value of parameters. A designer only inputs the “independent” value in modeling. The values of other parameters are calcuated by the parametric logics. Various forms of a building element can be generated according to the set of independent values, even though they share the same parametric logics. While implementing the drawing method used by traditional carpentry, I adjusted some parameters and functions for improving the user interface and convenience. Experiment of Hybridization Different roof types and glass masses are combined into an integrated roof system covering the enlarged timber structure below. During design process, the integrated roof was divided into several parts and its proportion was adjusted for both of spatial need and aesthetic purpose. It was a fascinating experiment of hybridizing traditional form, tectonic, universal space, and modern building technology. Civic Center as a Public Space As a civic center, the space should be opened and easy to enter. I proposed two entrances. One is the entrance to the building inside and it is directly connected to atrium to the public library and public service center which will be the most frequently used spaces by citizens. The other entrance is for the courtyard which faces north elevation of civic center. The courtyard is surrounded by civic center and existed buildings and the old trees will greet the citizens who has enjoyed this place since it was built as public school in early 19th century. Traditional Roof with Glass Mass Because the there has been no way to introduce sunlight, the space between the ceiling and the roof has not been used in traditional architecture. It is a considerable loss of space so that I combined the traditional roof structure with transparent mass which uses contemporary curtain wall system to introduce the sunlight. The glass mass is higher than the traditional roof and it serves spaces for skylight. In the public library, I exposed the timber structure because it is well matched to the texture that books and bookshelves make. Timber Frame Structure and Details To design the structural frame of Jongno Civic Center, I actively applied the principle of traditional Korean timber frame. To increase load bearing capacity, I reinforced the traditional wood joint with metal. What is the range that a set of rules in the book works? My initial question starts from the first exercise. The parametric operation of the Villa Rotunda model generates a lot of variations. While the variations are acceptable to a certain level, the model also generate ‘proportionally broken’ variations. I assume that a set of rules works in a certain range and it should be modified “somehow” to respond to the various architectural needs. The Process The first two keywords are “minimal condition” of scaffolds and “fiber to fiber interaction” generated form. Another important idea was mandrel. With this mandrel idea, we tested a robotic fabrication. Those are developed into component system and its variation. And we started the hierarchy study from the mandrel idea and the hierarchy study evolved into the component connection system. We finally reached to special morphology which is inspired by glass sponge. Link the mountain to urban life Because of the rapid modernization of Seoul, Mt.Nam-san is surrounded by urban area. Urban infrastructures, such as tunnels and roads, penetrate the mountain.Now, it is very hard to go by walk from downtown, even though there are amenities. This project aims to increase the accessibility to Mt. Nam-san and restore the original landscape of this place. The basic idea is covering “3-dimensional form of plate” above the valley to tunnel. The plate going to offer a route for the mountain and serve for a ceiling of diverse facilities: gallery, performance hall, food court and water fountain squares. I designed the form of the plate following the original landscape of this area before the tunnel was built. It connects the existing amenities, such as Nam-san walkway, trail and cable car station. original landscape of this area before the tunnel was built. Program Organization The basic idea is covering “3-dimensional form of plate” above the valley to tunnel. The plate going to offer a route for the mountain and serve for a ceiling of diverse facilities: gallery, performance hall, food court and water fountain squares. I designed the form of the plate following the original landscape of this area before the tunnel was built. It connects the existing amenities, such as Nam-san walkway, trail and cable car station. original landscape of this area before the tunnel was built. The Memory Scattered in the City The church is composed of 25 ‘camp’s and one camp is composed of about 20 ‘team’s and one team has 30~50 members. Even the largest worship hall can accommodate 2000 people, which means only 2or3 camps can come together for a worship service. The camps are grouped and come together in different time and place. For this, there are 6 identical Sunday worship services and they are broadcasted to each branch. While one group of camps is participating worship service, other camps do various activities, such as team meetings, bible studies, volunteer works, missionary works, and so on. These activities are scattered into surrounding area. The New Model for Mega-church Instead of massive construction, I suggested different strategies for expanding, such as adaptive reuse, renovation and even lease. The new model for mega church contributes to urban regeneration and offers spaces for community service well as worship service. Renovation Namsan tower and Samil church are in sight of the ‘Sam-il Observatory’, and from this view point 4 story buildings and the run down residential areas were remodelled. The lower sections of the buildings have cafes and outdoor decking to enjoy the surroundings, whereas the higher sections are designed for prayer space and bible study lounge. The outdoor decking space is linked by stairs to give short cuts in between levels and serves for community cafe. ‘Sam-il Outdoor Bible School’ locates in the middle of residential area. It has been redisigned the deserted wooden structure for the children of this region. Several slides were installed using differences of topography. In weekdays, it is used as a playground for the neighborhood. It also serves as a space for children’s bible school in the weekends. Renovation ‘Sam-il Missionary Center’ connects the discontinued footpaths for localities and offers short cuts. The external wooden decking is extended indoors to create space for missionary center. The decking is also connected to the rooftops where locals can use it as a park. The rooftop park will become an open space for outdoor activities for people living in densely populated areas. ‘Sam-il Outdoor Worship Place’ has kept the original structure of an existing building for the atmosphere of the locality. This place offers space for various events and activities of the Church and local residents. Free food service and flea market will take place during the weekdays and it will be transformed as an outdoor congregation place on Sunday. The internal space of the existing building is composed of two parts, a kitchen and storage. The seating can be configured to accommodate various numbers of people for each of the events and activities so that the space can be used efficiently. The place is open to the local residents as a communal space. “Pray at Dawn” hall is located at a junction five streets meet. Local residents can use the junction as a terminal to shorten their journeys and benches have been installed for those who may wish to seek refuge. The shortage of cemetery has been an issue in Korea. I redesigned the old apartment, which had been abandoned, into the church cemetery. It offers charnel house for the local community. Its ‘Pray at dawn’ motto is important to the church as is its close proximity and central location for easy access to its service. On the 2nd and 3rd floor it has its own congregation space and meeting place connected by spiral staircase in the middle. The open plan staircase is intended to promote interaction between the local residents walking across and the churchgoers walking down. Most Mega churches have a cemetery for their congregation. It is normal for a memorial service to be held out of the city in Korea, however in this project we are creating an exemption to this norm by incorporating a memorial place close to the centre. There will be a congregation cemetery and memorial service on the upper floor of the building. Cultural Identity in Timber Frame Roof design varies according to the vertical relation of the structural frames, even same combination of structural frame are used. In case of Iro-dang, the column purlins on X-axis(5-purlins) and Y-axis(3-purlins) make two joints at the inside and outside of corner. Also, the middle purlins on X-axis and the top purlin on Y-axis make two joints on the upper level of former. *Original drawing Is housed at the National Archives of Korea. National archives of Korea, the depository of historical records of the country, have recently constructed digital data base of colonial-era buildings. The data base includes schematic plans and detailed drawings of the buildings. It allowed us not only grasp a concept of the design principle, but also understand the structural system and the concrete building methods. I selected 22 buildings constructred in this period after reviewing drawing collection of National archives of Korea and The Academy of Korean Studies to perform this research. The drawings were so detailed that I had to abstract them to diagrams which only includes columns, rafters, truss members and roof tiles. Tobacco Factory in Je-cheon, Korea. Built in 1945. Designated as Modern Cultural Heritage.